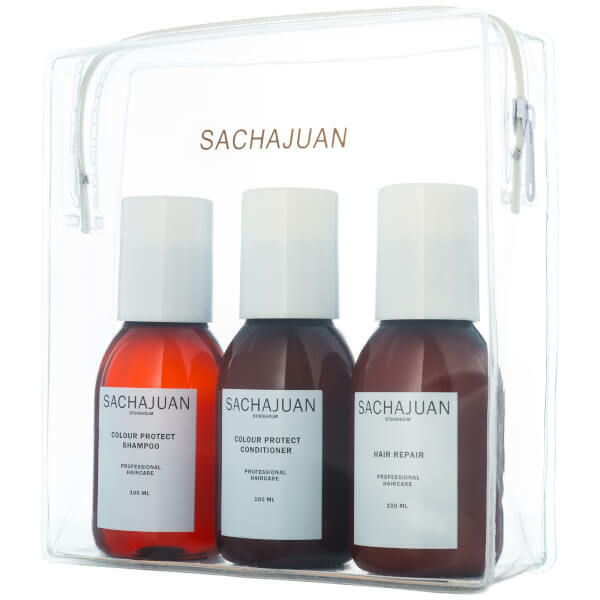 Restore vibrancy and shine to colour-treated locks with the Sachajuan Colour Protect Collection, a trio of deeply nourishing, conditioning formulas that defend against damage and leave hair bright and healthy. Thoroughly cleansing, the shampoo is specially designed to prevent colour loss and ensure hair remains healthy-looking. Utilising Sachajuan’s signature ‘Ocean Silk’ technology, the shampoo delivers long-lasting care and enviable shine, without weighing hair down. The cleansing formula also protects against free radicals and heat styling, ensuring coloured hair remains healthy as well as vibrant. Utilising the exclusive Ocean Silk Technology alongside an additional water-resistant UV shield, the nourishing formula infuses colour-treated hair with proteins and mineral extracts to strengthen and hydrate each strand while preventing fade and dullness. Providing superior deep conditioning, tresses are left detangled and supple, with enhanced shine and revitalised colour vibrancy and tone. Revive frizzy, stressed-out hair with this intensive long-lasting treatment. The serum uses Ocean Silk Technology to promote cell regeneration and strengthen individual strands to leave hair healthy and silky with a salon-professional finish. Shampoo: Massage into wet hair. Work into a lather. Rinse out thoroughly. Conditioner: Massage into washed hair and comb through gently. Allow 1-2 minutes to work in. Rinse well. Hair Repair: Massage into washed hair, allow 5–10 minutes to work in. Rinse well. Shampoo: Aqua (Water, Sodium Laureth Sulfate, Glycerin, Cocamidopropyl Betaine, Glycereth-2 Cocoate, PEG-4 Rapeseedamide, Parfum, Chondrus Crispus Extract, Hydroxypropyl Guar Hydroxypropyltrimonium Chloride, Sodium Benzonate, PEG-7 Glyceryl Cocoate, Citric Acid, Silicone Quaternium-22, Sodium Chloride, PEG-150 Pentaerythritly Tetrastearate, Trisodium Sulfosuccinate, Disodium EDTA, PEG-6 Caprylic/Capric Glycerides, Dipropylene Glycol, Polyglyceryl-3 Caprate, Linalool, Limonene, Benzyl Salicylate, Hexyl Cinnamal, Alpha-Isomethyl Ionone, Butylphenyl. Conditioner: Aqua (Water), Sodium Laureth Sulfate, Glycerin, Cocamidopropyl Betaine, Peg-4 Rapeseedamide, Glycereth-2 Cocoate, Sodium Chloride, Parfum, Chondrus Crispus (Carrageenan) Extract, Glycol Distearate, Hydroxypropyl Guar Hydroxypropyltrimonium Chloride, Peg-7 Glyceryl Cocoate, Cocoamide Dea, Phenoxyethanol, Methylparaben, Butylparaben, Ethylparaben, Propylparaben, Isobutylparaben, Citric Acid, Alpha Isomethyl Ionone, Benzyl Salicylate, Butylphenyl Methylpropional, Hexyl Cinnamal, Limonene, Linalool. Hair Repair: Aqua (Water), Behentrimonium Chloride, Cetyl Alcohol, Stearyl Alcohol, Propylene Glycol, Amodimethicone, Parfum, Hydrolyzed Rhodophycea Extract, Hydrolyzed Wheat Protein, Isopropyl Alcohol, Phenoxyethanol, Glycereth-2 Cocoate, Cetearyl Ethylhexanoate, Peg-7 Glyceryl Cocoate, Peg-40 Hydrogenated Castor Oil, Sodium Chloride, Cetrimonium Chloride, Trideceth-10, Ethylhexylglycerin, Isopropyl Myristate, Linalool, Citric Acid, Limonene, Benzyl Salicylate, Hexyl Cinnamal, Alpha-Isomethyl Ionone, Butylphenyl Methylpropional.